The modern kitchen offers s dishwasher, ice maker/ cold water dispenser/refrigerator, garbage disposal, convection oven, microwave, toaster, electric range/oven, blender, Kuerig Coffee Maker, Mr. Coffee machine, electric hand mixer, iron and ironing board. 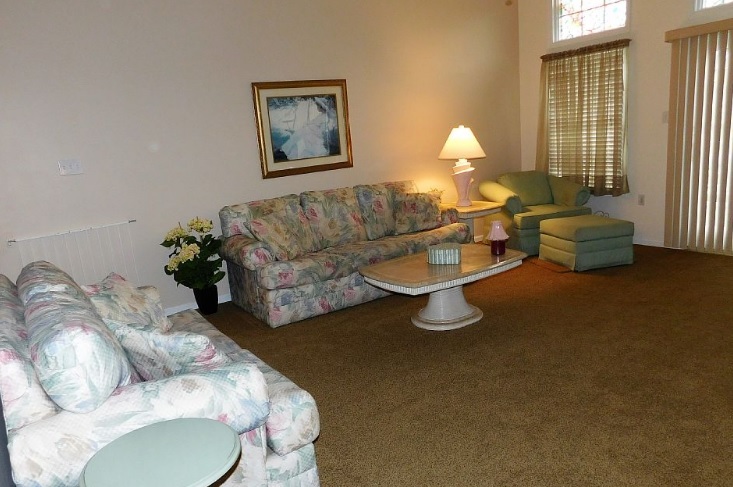 A full size capacity washer, dryer, and laundry tub are located on the first floor. The large cathedral ceiling living room has a Victorian theme and, although not needed in the summer months, it also has a gas fireplace. A private balcony, off the living room, is equipped with a round table and chairs underneath a large awning, that provides relief from the hot afternoon sun. The first floor offers a large bedroom with 2 queen size beds, wicker bureau, mirror and nightstand, and a Samsung 32" Smart flat screen TV, with a Samsung Blu-ray DVD player. There is a large mirrored sliding glass door closet in the room, and another one in the hall. The second first floor bedroom boasts a king size bed, wicker double bureau, mirror, chest and nightstand. A complimenting upholstered swivel chair completes the room's décor. Sliding glass patio doors, open onto the outside deck, overlooking the yard, equipped with a barbeque grill, and table and chairs for outside dining. The fenced yard has a gorgeous garden area and 6 foot vinyl fencing. There is an enclosed outside shower for showering off sand in the yard. 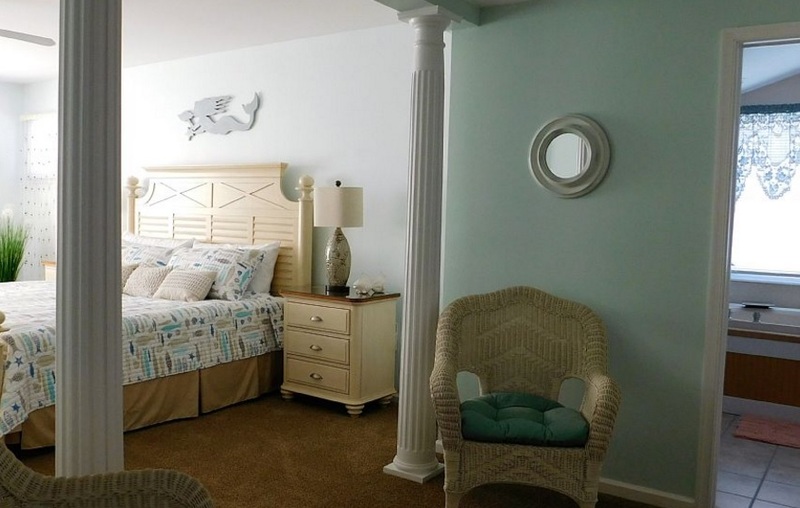 The second floor master bedroom is decorated with a beach umbrella theme, has a large wicker triple bureau, mirror, chest, 2 night stands, and a complimentary white washed rattan chair. This room is bright and cheerful, as the sun streams into the room from its 3 windows. A full size bathroom, with enclosed tub and shower, are just steps away in the private hallway. The penthouse master bedroom features a private sitting area, with white pillars that face into the bedroom from the sitting area, gorgeous brand new cream with light walnut tops' furniture, which includes a king size poster bed, double dresser and mirror, and 2 nightstands. There is a loveseat in the bedroom that compliments the room's décor. The room also has a 40" Samsung Smart flat screen TV, with a Blu-ray DVD player. The private bathroom offers both a whirlpool tub and a full size enclosed shower. There is ample closet space behind two folding doors. 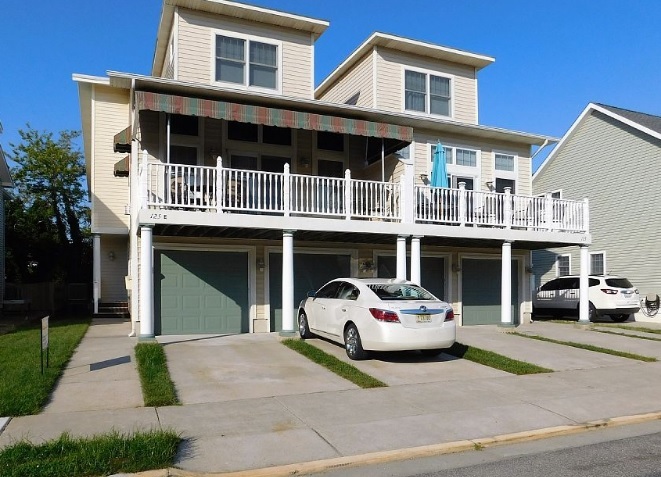 The townhome has a private 2 car garage for beach chair and bike storage. There is parking for 2 cars in front of the garage doors. Suitability: Children welcome, non-smoking guests, pets not allowed.